I will be speaking about Harriet Hosmer at Cedar Crest College on Friday March 23 at 1 PM. I’m very excited, especially as it was arranged by one of my Harriet Jacobs Family Papers colleagues, who in addition to being an excellent researcher also blogs about beer. (A great combo of credentials, I think.) Introducing students at an all women college to Harriet Hosmer seems like an appropriate way to celebrate women’s history month. I’ll be speaking at the Wellfleet Public Library, on Cape Cod, about Harriet Hosmer: A Cultural Biography July 27 at 8 PM. I’m very excited, as I love Wellfleet, which is one of the most beautiful spots on the Cape. And it is a great public library. Another must on a trip to Wellfleet is Mac’s Seafood, a terrific fried food shack on the town pier. It even as peppermint ice cream, which is my favorite flavor and is harder and harder to find. Here are few pictures of my family’s trip to Mac’s Seafood from last summer. 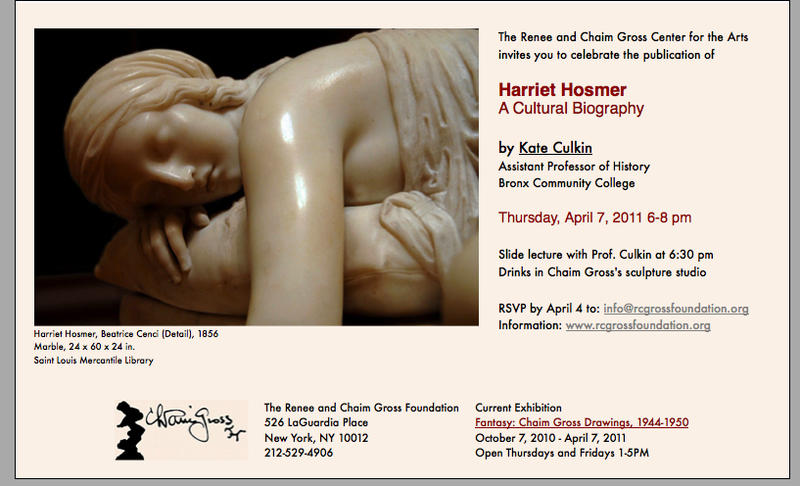 On April 7, there will be an event to celebrate the publication of Harriet Hosmer: A Cultural Biography at the Renee and Chaim Gross Foundation. Born in Austria in 1904, Chaim Gross emigrated to the United States in 1921. He became a well known sculptor, working primarily in wood, and was a founding teacher of sculpture at the New School. The event will take place in his studio, which is filled with his work. I don’t believe the models from the picture linked to will be there; if so, they are likely to be clothed. 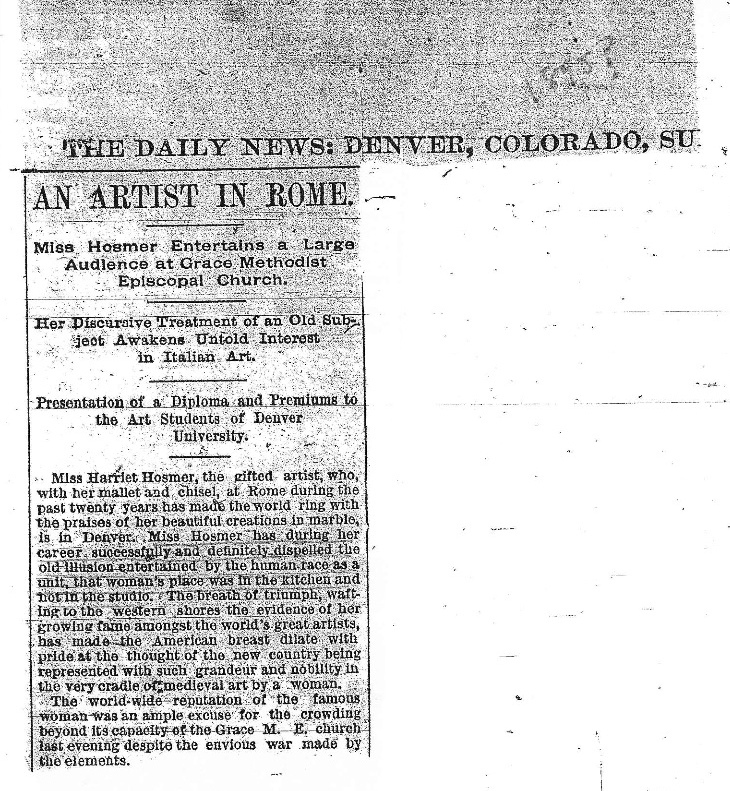 Below is a newspaper clipping about the art prize ceremony. As some of you know, I will speaking about Harriet Hosmer: A Cultural Biography at the LoDo Tattered Cover on March 22 at 7:30. When I contacted my high school’s alumni office about the event, the alumni coordinator kindly suggested that she feature the event in the alumni e-newsletter and highlight me in the “Alumni Corner.” (Scroll down). As a biographer, it was fun to think back on how my high school experiences shaped my later life. The high school in question is Kent Denver, known as the Kent Denver Country Day School when I went there. The school’s most famous alumnae is Madeleine Albright, who graduated from Kent in 1955, when it was still a school for girls. (It later merged with the Denver Country Day School for boys). When I was finishing my dissertation, I would often wake up (kind of in a panic) in the middle of the night, wondering if and when I would be done and what would become of me afterward. During of those bouts of insomnia, I watched a documentary about Albright in which she discussed finishing up her Ph.D. while taking care of her young children. It put my struggle in perspective and was oddly comforting. (And I loved her appearance on the Gilmore Girls) So let me conclude by saying Go Sundevils! 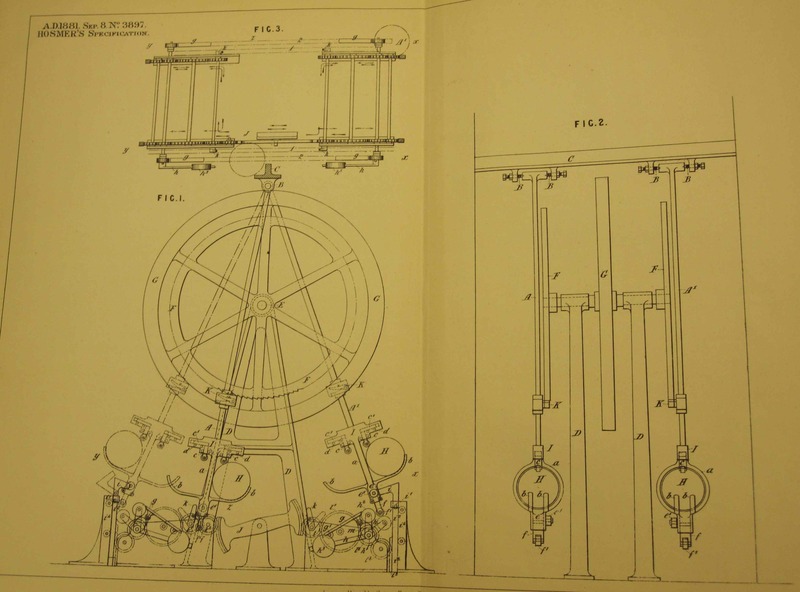 One of my happiest moments as a researcher came when I found the drawings of the invention Hosmer had submitted to the British Patent Office at the New York Public Library’s Science and Industry branch. I had gone in the hopes of learning how I would go about contacting the British Patent Office to begin a search. But I lucked into asking a very knowledgeable, very helpful librarian, who knew the library held the patent office’s Official Journal, which includes the descriptions and illustrations submitted with patents. It took him a while to find them, as they had been miscataloged, but he finally dug out the volumes I needed, which clearly no one had looked at in decades. They were covered with dust. While I had read her descriptions of the machine, it was amazing to see illustrations of them. I couldn’t believe the information was right here in the New York. The patent below is the one she submitted in 1881.